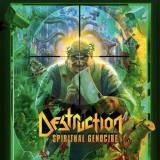 The thirteenth full-length from German thrash legends Destruction sees the band continuing along the D.E.V.O.L.U.T.I.O.N and Day of Reckoning path with little touches here and there to prove they’re not repeating themselves. Solid, technical thrash metal is what we get, 80s music with a modern production, good songwriting and great playing – it seems like the band at its best on initial listens, although with familiarity you definitely wouldn’t rate it the highest of recent Destruction output. You’re guaranteed a good time, however, particularly since this release marked the 30th anniversary of the band, and the band pushed the boat out by trying to make it as heavy and fun as good thrash can be. After the militaristic drumming and atmospheric chugging of intro Exordium, first track proper Cyanide rushes in, all downtuned riffing and Schmier-y sneering. It’s a decently violent opener, but the album doesn’t really get going until the following title track, when Sifringer starts cranking out the cool soloing. Renegades is a nice mixture of old-school intensity and modern chugging, right up until an awesome thrash break. City of Doom has a deliciously old-school-Megadeth-y riff to it, while Carnivore and Riot Squad (aren’t these titles clichéd? Thrash bands need a new Big Book of Song Titles…) are the sort of aggressive thrash assaults that Destruction do so well, the latter especially killer for the soloing alone. Sure, there are a few less compelling moments – To Dust You Will Decay’s decision to slow things down makes it drag a little, despite there being some cracking guitarwork and a great chorus present, and the self-congratulatory Legacy of the Past comes off as a poor man’s The Alliance of Hellhoundz, even with a galloping pace and the boys from Sodom guesting. It’s all enjoyable, however, good solid thrash with a satisfactory crunch – finale Under Violent Sledge might have a particularly stupid name, but it absolutely rips, and brings the album to a close nicely. Whichever of the German big three is your favourite, I’ve always got the most basic enjoyment out of Destruction, and Spiritual Genocide is more proof that the band know how to keep a smile on your face.